Meet the team that ticks every box. We firmly believe in focusing our team on supporting the customer and we invest in regular training to promote a culture of continuous improvement, and enhance your dealings with Armorgard. Every team member within armorgard is vital for maintaining our outstanding customer service, however we have selected a few from the team for you to have a closer look at, and learn some interesting facts! When did you join the Armorgard team? Seeing quick results which lead to success. The most rewarding thing about working for Armorgard? The most rewarding thing is seeing the brand growing fast. If you ran like your mouth, you’d be in a good shape. well known product name. have had vehicles in the past with armorgard boxes fitted in. the height of the product means it fits below the sides of my pickup. dark colour means it is less obvious. unlike other products on the market. 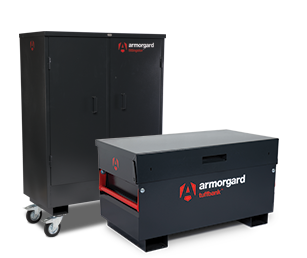 armorgard design and manufacture market leading products for secure tool storage, efficient manual handling and improved site safety. We will increase productivity and make work places safer across the world through the provision and application of our innovative solutions. We believe in friendly co-operation, a helping hand when you need it and praise for a job well done. Integrity lays the foundation for strong relationships, so we believe in partnerships with customers and colleagues based on honesty and transparency. We shoulder our responsibilities and commit to achieving results together. We do as we say and say as we do. We embrace new ideas, inspire with our energy and positive attitude. We love what we do and it shows in our dynamic approach to product development and customer care. We go out of our way to exceed expectations through innovation, continuous improvement and exceptional customer service. Our supply chain to the market is through a wide network of distributors. We are here to do everything we can in assisting our distributors, from our supportive marketing literature right through to delivering on our promises; we do everything we can to help you win.